Terex is introducing a new line of wheeled skid-steers to complement its established line of Posi-Track loaders. With 8 models ranging from 37 to 62kW (50 to 83hp) in both radial and vertical lift options, these are built tough and packed with loads of useful features. CCF recently had an opportunity to get a first glimpse of one, the new TSR-60, a model Terex believes will be the most popular size in Australia. Read on to learn more about this machine and the full line. When designing its new range, Terex elected to engineer the machines from the ground up, rather than utilise common frames from its existing Posi-Track line. "Through this approach, it was able to optimise the performance characteristics of both products to suit the unique features of each machine," Rick Harris, Terex Inc's international sales manager said. 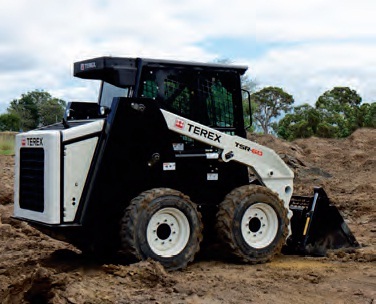 Terex claims the result is a skidsteer that delivers more power, greater comfort, better performance, easier maintenance and works where others can't. "Compared to the competition, they offer higher ground speed, greater fuel capacity, more wheel torque, and better ground clearance." The TSR-60 weighs in at 2.94t, with a safe working load (SWL) of 680kg, rated at 50% of the tipping load. The model the CCF inspected, included the 2-speed option, with a best in class top speed of 19.3km/h. For a compact machine, it has a lot of pushing power, with 3.93t of advertised tractive effort. Load sensing hydraulics is present across the range. To get more done on every jobsite, Terex built the machines to maximise productivity. A 95L fuel tank keeps pump attendance down, allowing the machine to breeze through the day without the need to worry about refuelling. When the going gets tough the 266mm ground clearance and 28° rear angle of departure, keeps the TSR-60 from getting hung up on obstacles. 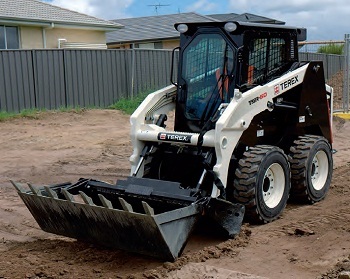 For added versatility, Terex skidsteers feature a unique "stepped" boom design, to easily accommodate overthetyre steel tracks, for improved wet weather traction. All models come with optional sealed and pressurised cabs, and the operator station provides outstanding comfort and visibility. 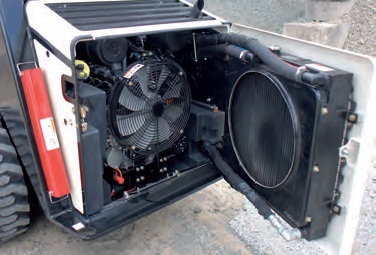 The climate control system is flush mounted behind the cab for better cooling and service access. All models come equipped with easy to operate, hydraulic pilot-type joystick controls and standard proportional flow hydraulics for precise control of attachments, such as the 4 in 1 bucket. The entire range features a unique low profile loader tower design – even on vertical lift models – which greatly improves rear visibility for the operator. All machines are pre-wired for an AM/FM radio and speakers, and a convex rear-view mirror, finishes off the cab. The range of Terex skidsteers, incorporates an easy to lift cab, for simple access to pumps and drive motors. In addition, they feature a unique swing out radiator and hinged bonnet, for unparalleled access to the engine bay. The cooling system is clearly designed, to be able to keep the machine running even in high ambient temperatures, under demanding loads. The rear of the machine is well guarded, with a solid bumper that protects the rear steel door from scratches, when working in tight quarters. A 50mm receiver hitch is also available. Durability is engineered into the wheel axles, with standard mechanical face seals and heavy duty axles designed to prevent premature wear of axle bearings.